This is a combination of interconnected tasks that engages students in a complex situation. It allows them to build new vocabulary, use their existing knowledge and language competencies, and practise newly learnt words in different contexts. 1) Individual students write as many linking words they can recall as possible. 2) Students work in groups and categorise all the words they have produced into groups according to their function or meaning. 3) The whole class shares and discusses original categories with examples of linking words produced by the groups. 5) Both student-generated and teacher-provided tables are compared and discussed. Usually, both overlap to a certain extent, so it is useful to emphasise the student-generated contribution. 1) Students are presented with a topic relevant to their field(s) of study or interest. 2) Each student forms an opinion on that issue and writes that opinion in one sentence on a sheet of paper. (b) no linking word can be repeated in one text. Note: The task is getting slower and slower with each change because students need more time to read the whole text written by their peers. Four to five changes are usually enough for the purpose of the task. 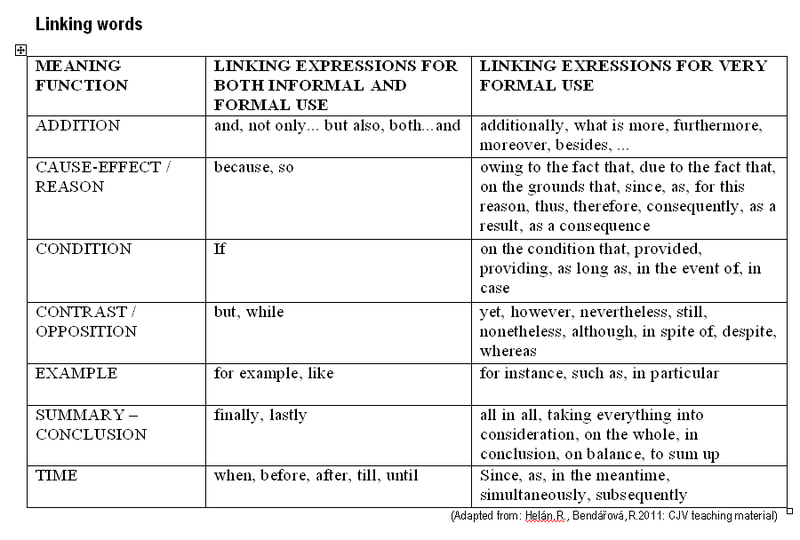 5) Students write a synonym for each underlined linking word in their texts that is suitable in the given context. 5) and they can also think about the use of synonyms in the given contexts. At the end, it can be useful to stress the importance of linking words for a smooth flow of argumentation and ideas in academic texts. On the other hand, it is important to emphasise that not every sentence in a real text starts with a linking word - that linking words should not be overused.